County War Memorial at Montgomery01938 552043work Historic SiteIn 1923 County War Memorial was completed to commemorate fallen servicemen from Montgomeryshire County. It was built by means of public subscription. Standing 14 metres high, 320 metres above sea level. It is built of white Portland Stone and was originally dedicated to those men from Montgomeryshire who fell in the 1st World War. 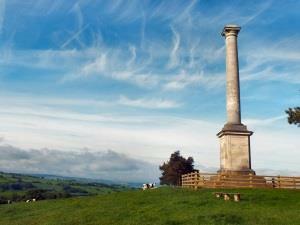 Situated on Town Hill overlooking Montgomery and is visible for many miles in all directions. The moderate climb up from the path opposite the Castle car park is quite easy. Good footwear is recommended. Beautiful views reward the visitor from the top with Cadair Idris clearly visible on a fine day showing the sun its way to bed. In 1990 the monument was seriously damaged by an earth tremor. For the next 12 years the repair and refurbishment of the County War Memorial became the sole focus of attention for one man - Terry Boundy, who noted: - "The object must be to repair the County War Memorial and to hold in trust with Montgomery Town Council funds sufficient for this work to be carried out and leave a sufficient amount for the future care and upkeep of the Memorial." In addition, he required that proper direction signs were erected; an entry be made in the local Guide Book co-ordinated in addition with the details of Montgomery Castle so that each would enhance the other as an attraction for visitors.